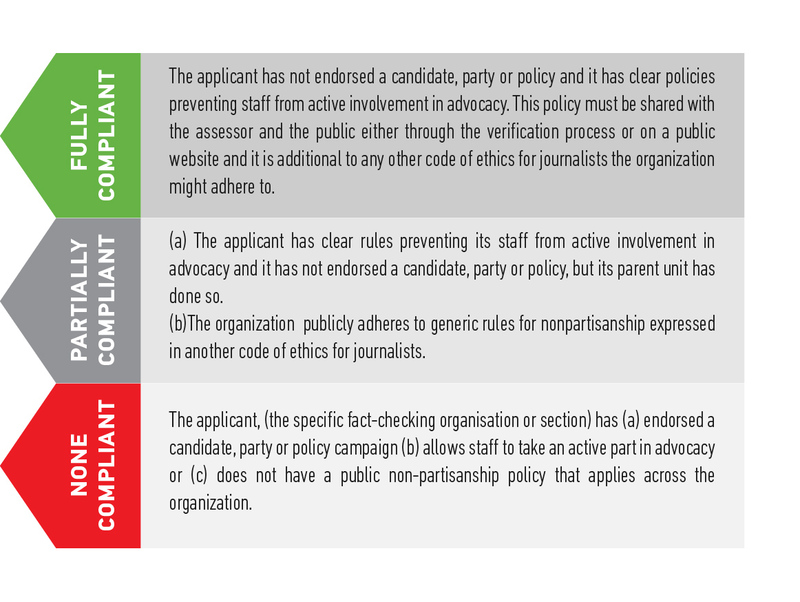 The external advisors who review the applications review twelve aspects related to our five principles: non-partisanship and fairness, transparency of sources, transparency of funding and organization, transparency of methodology, and open and honest corrections policy. 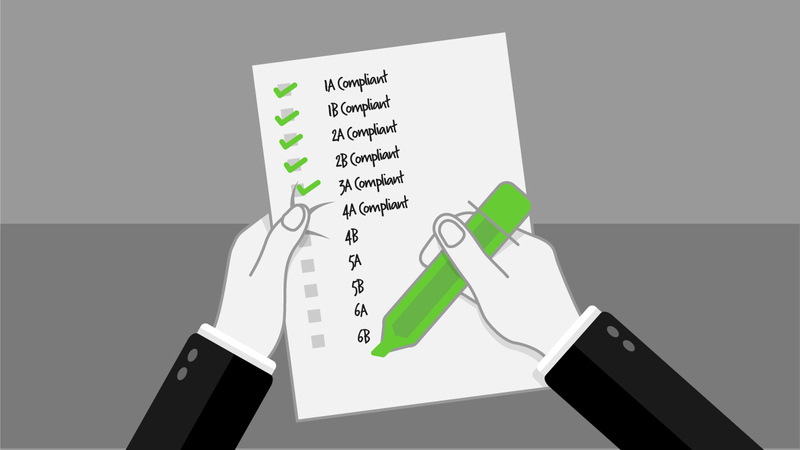 The evidence shared by the applicant for each criterion can be rated as "compliant", "partially compliant" or "non compliant". 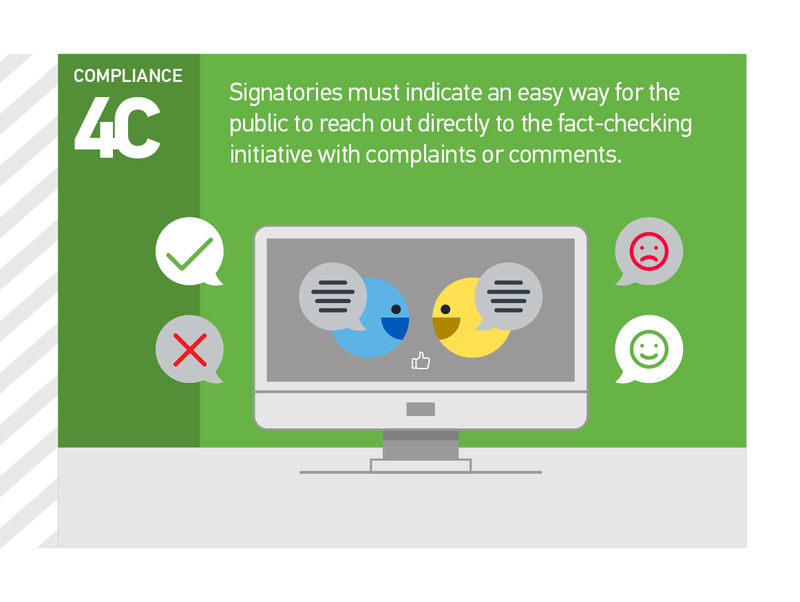 Check the minimum evidence an aspiring signatory must submit and the guidelines used by external assessors to conduct their assessments or go to Signatories to review the application documents and assessments each verified organization has submitted. The code of principles is for organizations that regularly publish nonpartisan reports on the accuracy of statements by public figures, major institutions, and other widely circulated claims of interest to society. This includes the verification of multimedia content that reached a wide public with the intention to deceive. 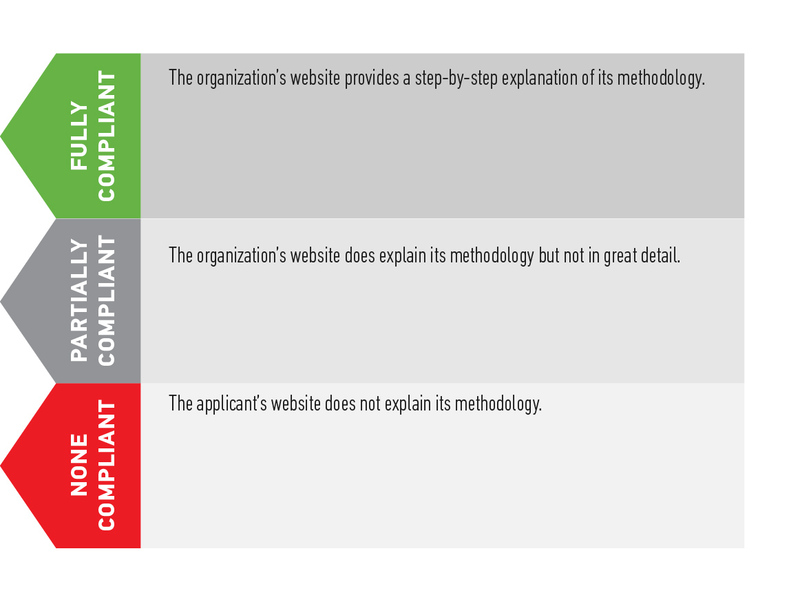 a) Proof of legal registration or organizational status. b) Links to website or location of fact checks published in the previous three months. 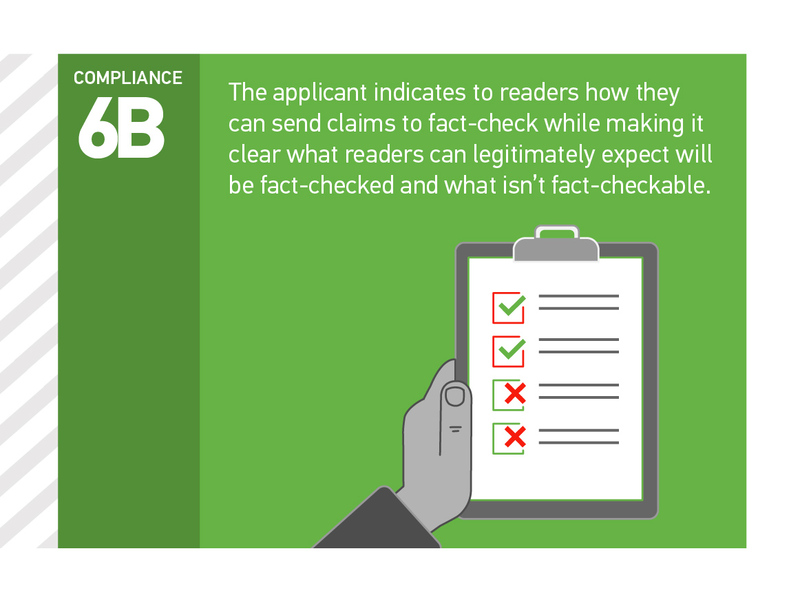 Principle 1 "We fact-check claims using the same standard for every fact check. We do not concentrate our fact-checking on any one side. 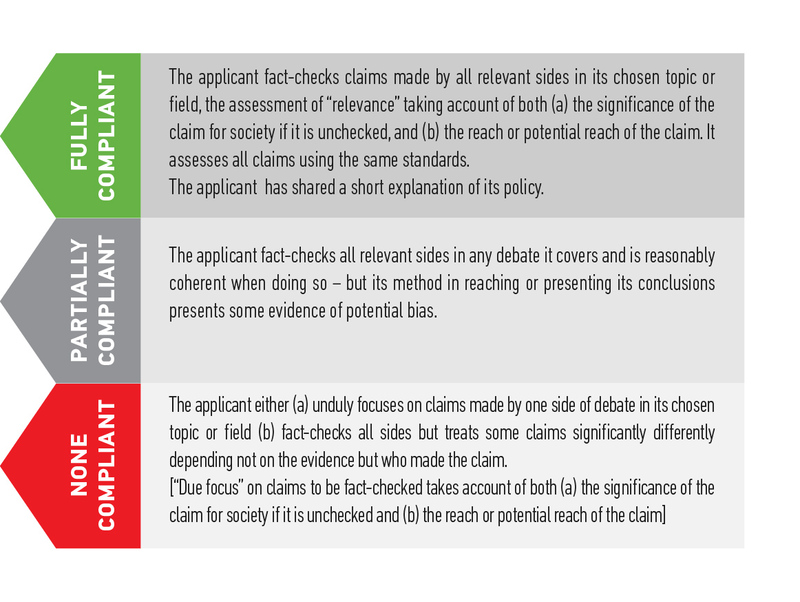 We follow the same process for every fact check and let the evidence dictate our conclusions. We do not advocate or take policy positions on the issues we fact-check." 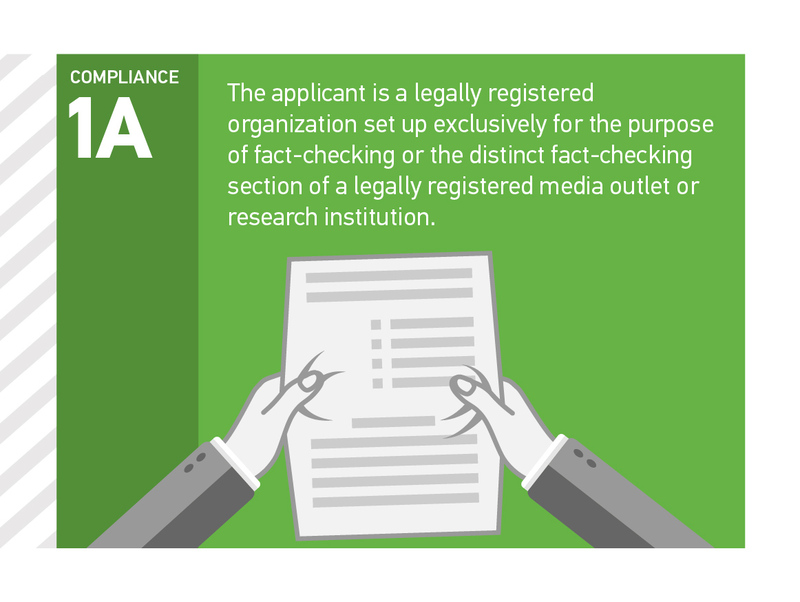 a) Links to ten fact checks proving scope and consistency of fact-checking accompanied by a short and public explanation of how the organization strives to maintain standards. 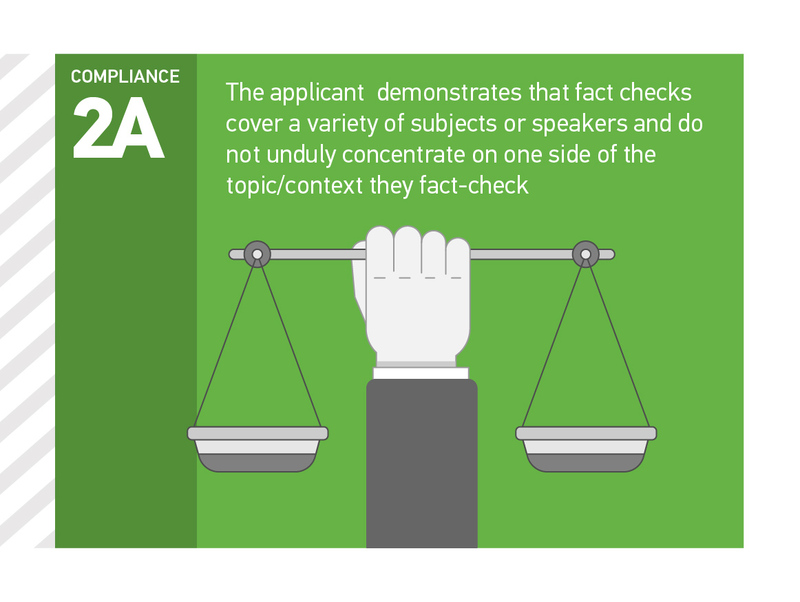 The assessors reserve the right to select examples beyond the ten fact checks. 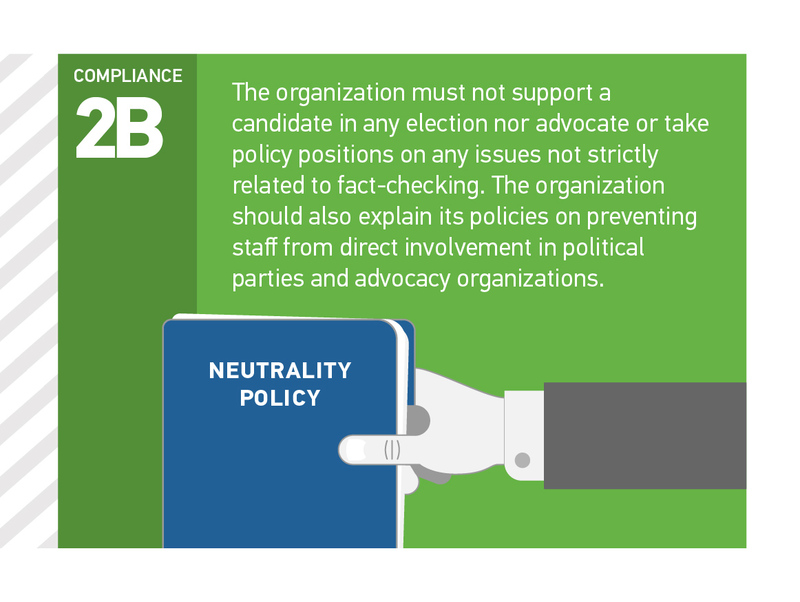 b) A Policy regarding advocacy/political positions from the organization and its staff. 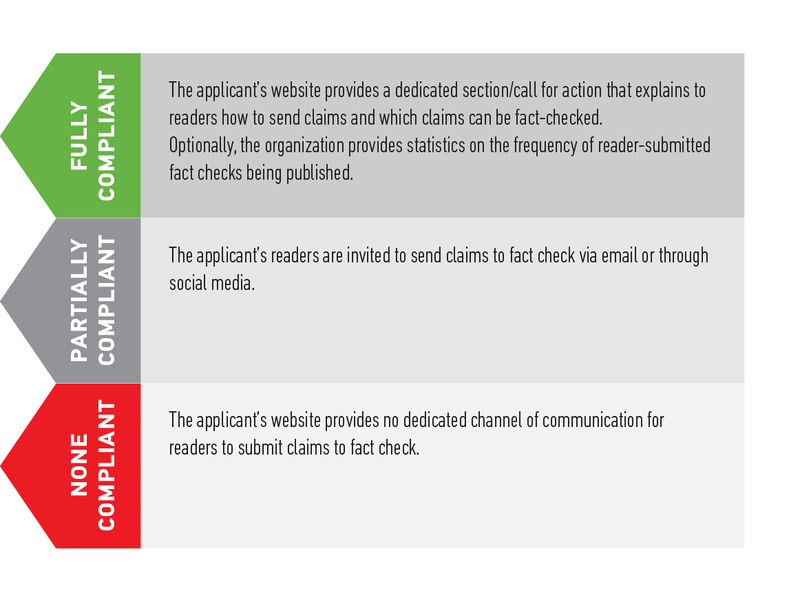 Principle 2 "We want our readers to be able to verify our findings themselves. We provide all sources in enough detail that readers can replicate our work, except in cases where a source's personal security could be compromised. In such cases, we provide as much detail as possible." A brief and public explanation (500 words max) of how sources are provided in enough detail that readers could replicate the fact check. If the applicant has a policy on sources, it should be shared here. 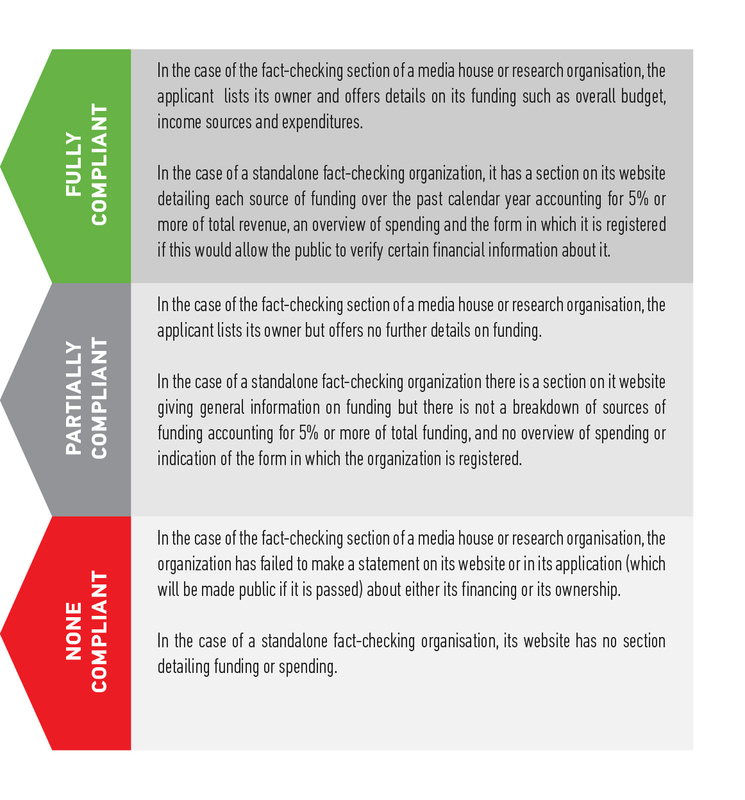 Principle 3: "We are transparent about our funding sources. If we accept funding from other organizations, we ensure that funders have no influence over the conclusions we reach in our reports. We detail the professional background of all key figures in our organization and explain our organizational structure and legal status. We clearly indicate a way for readers to communicate with us." 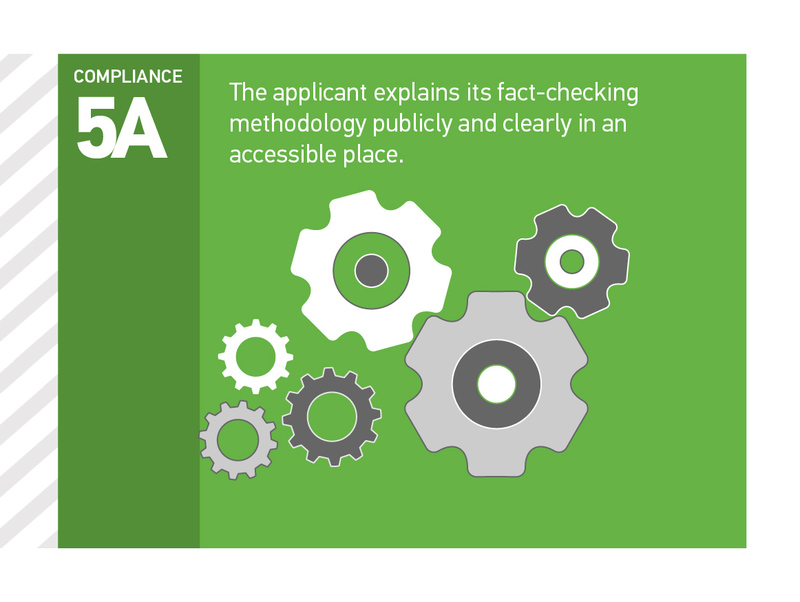 Principle 4 "We explain the methodology we use to select, research, write, edit, publish and correct our fact checks. 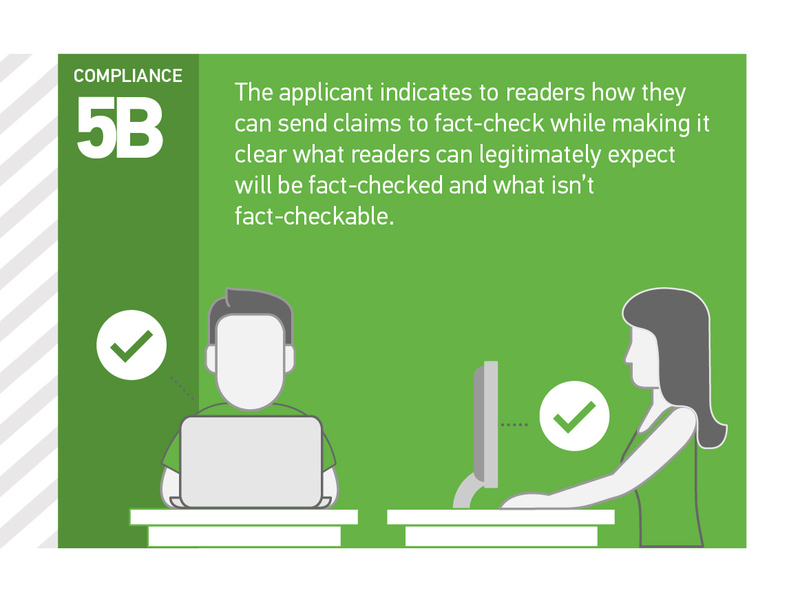 We encourage readers to send us claims to fact-check and are transparent on why and how we fact-check." 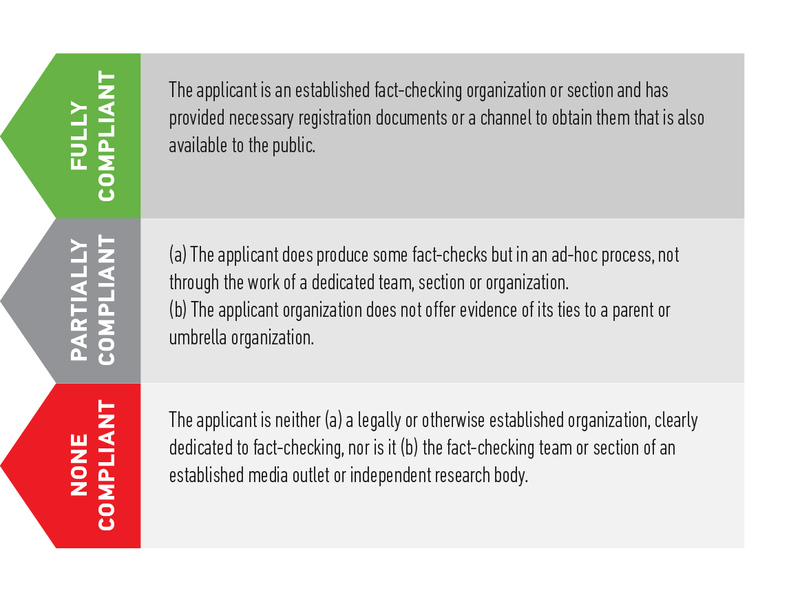 a) a link to a webpage where the organization clearly and publicly explains how the team chooses what to fact-check and disclose the step-by-step process to conduct the fact-check. 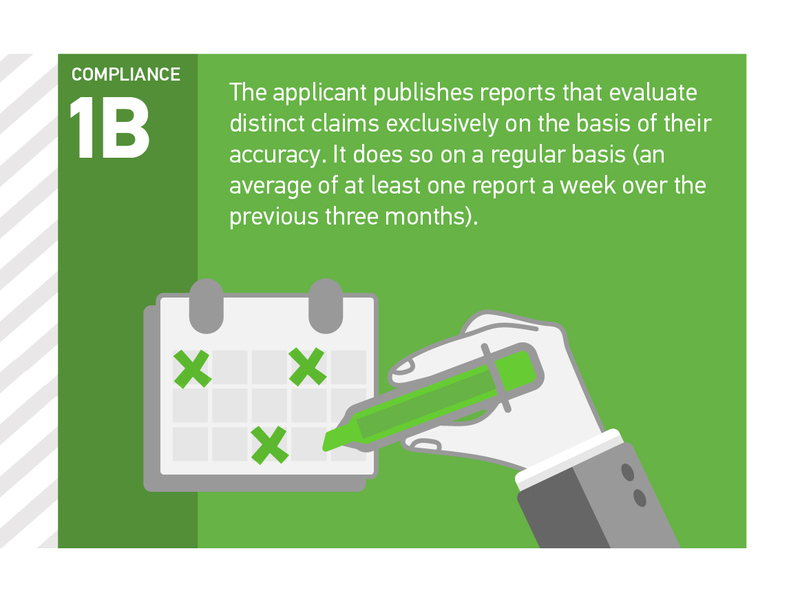 In case the organization rates the fact-checked claims, it clearly states what each rating means and when it is used. 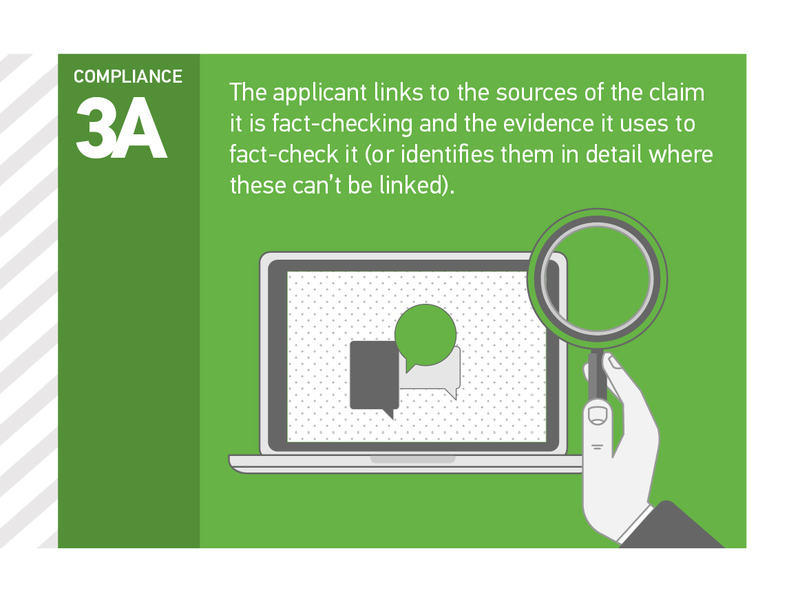 b) A link to a form, an email address, a telephone number, a whatsapp number or any mean of contact the audience can use to submit content to be fact-checked. 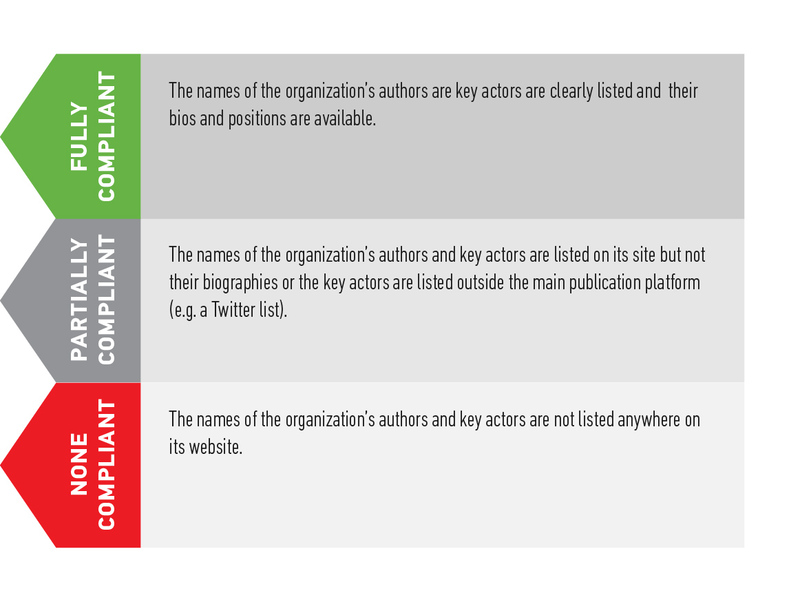 Principle 5 "We publish our corrections policy and follow it scrupulously. 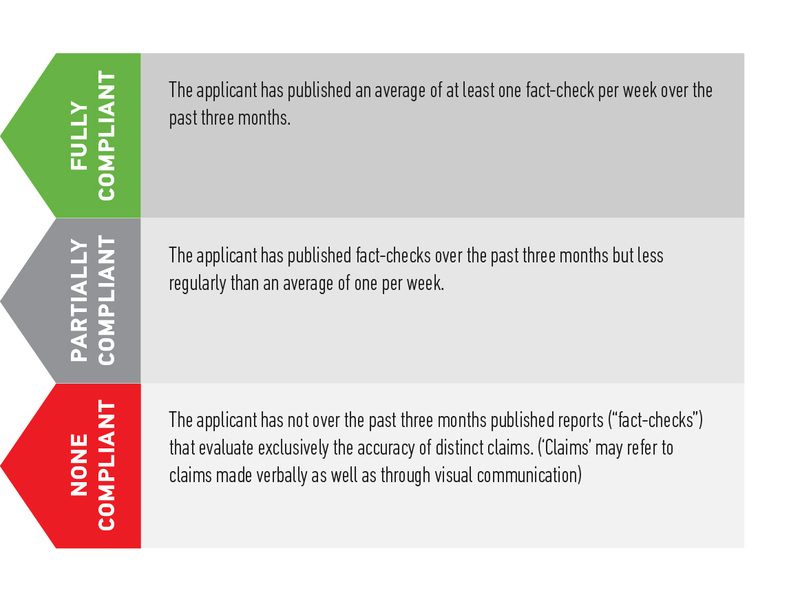 We correct clearly and transparently in line with our corrections policy, seeking so far as possible to ensure that readers see the corrected version." a link to the page with the corrections policy and one or two examples of a correction made, or correction requests handled, in the past year.